So, did you had fun celebrating your birthday with daddy and mummy last night? Mummy really had fun! At first, thanks to Ah Hwa grandma for preparing red eggs, mee and fried chicken for our lunch to celebrate your birthday like the Chinese traditional way. Then, we were at Gurney Plaza. Choosing a few presents for your right brain class friends as you requested. Eventually, we decided we buy breads with Mickey Mouse, Lollipop and Ice Cream shape for your little friends. Your teacher got one muffin mix too. Surprisingly, we met Auntie Michelle at Gurney Plaza. She accidentally knew that it was your birthday. We also met a clown distributing balloons in front of the Maxis center. So, you get all sorts of unexpected gifts. A flower balloon from the clown, A puzzle game from your teacher and a DIY photo frame from Auntie Michelle. Thank you! Thank you! Thank you! This bear is free from the Christmas Dinner set at The Ship. As we were heading to dinner at about 9.30pm, you suddenly asked for cake. Gosh! So late already. Where are we going to get cake for you. Luckily, we managed to order a small cake from The Ship restaurant. And, the cake was so delicious! Lots of walnuts and the chocolate was so rich! Mmm……Yum! Yum! Let’s hug hug, Hou Chun! Well done! Here you go. This is your party pack. Thanks for joining my party, Genny! Zhi Ying, you are always my best friend! Alright! Children, line up and go back to your class now. So this is how your 3rd birthday party ends. Mummy has quite a lot of pictures to put up in your blog and has quite a lot to tell too. Thus, I decided to separate the video from the photos. First, I wish you still remember that you had a beautiful “Strawberry Shortcake” birthday cake for your 3rd birthday even after many years later. She supposed to represent you as a sweet little girl. And, you have all your classmates to celebrate together with you. You seems enjoyed cutting the cake too. So, are you ready to distribute it to your friends now? Alright! Gently put it on the table. This is the way you serve you friend. Ops… she said:”No, Thank you.” So, can you pass it to other friend? Finally, it’s my turn to eat the cake. Mmm… Yum! Yum! Mummy appreciates this culture of your school so much. This is a great way to learn courtesy. Well, some of them just can’t wait to get the cake, some said “No. Thank you.” . And, many has enjoyed the cake so much just like you. Some had take away the berries. And, some just keep asking for more and more. And just when I thought this group of cake lovers might need some appetite suppressants to avoid over eating, all of us heard the 2 magic words — “Party pack”. Once teacher said come and sit down here to get your party pack, they just drop the spoon, leave the plates aside and sit down on the floor in no time. Obviously, party pack is more attractive than cake to these little ones. Daddy just can’t wait to see this. Yesterday was the first time you celebrate your birthday in school. Even though you seems so cool. Why are you not smiling? Also, you blow the candles straight away after the English version Happy Birthday song. May it be you just can’t wait to blow the candles and cut the cake? As you keep starring at the cake while your friends were still singing the Malay and Chinese version Birthday song for you. LOL! Thanks to your teacher and friends for the arrangement and participation too. Today, you are really busy. So this is what kept you so busy today. You were busy packing the party pack, or so called goody bag for your little friends as you are the host tomorrow. You were so excited while packing. Keep asking for more things to fill up the goody bags. As you always said, mummy, I want 4 candles. Mummy, I want airplane cake. Mummy, I want celebration. Yes! Yes! You are going to have your birthday cake, 3 birthday candles on it and a wonderful birthday celebration at school. And, you are going to distribute all these goody bags to each and every of your little classmates just as what your friend did for their birthday party before. Are you curious what’s in it? Have a look then. Yes! This is the second party pack she get since the last 4 months in school. And, Elizabeth already open it and start using the little presents in it such as glitters glue, note book, and pencil before mummy is free to take a picture of it. Children love party packs. And, many of her classmates have birthday parties in the school. Somehow, little Elizabeth’s birthday is on school holiday. After discussing with her teacher, mummy decided to make a birthday party for her on the last week of school days instead of during holiday camp. Mummy had yet to decided which day it is. But, It’s only about 3 weeks away. So,we better start thinking about what to put in the party pack? Where to buy a nice party pack or box? Shall we have a clown shaping balloons for the kids? Most importantly, how the cake is going to look like? Last year, we have 3D birthday cake and beautiful cupcakes. For a change, we ordered some fruit tarts this year instead of cupcakes. 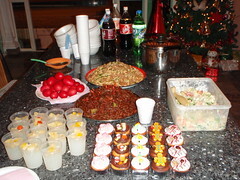 Just imagine 18 types of food for only about 17 people. I guess you know what’s up. Yeah… lots of left over. LOL! Thus, daddy said there will be no more home BBQ party next year. As there is too much work for mummy, too much left over. And, sorry for keeping you so long. Taa… Daa… Here’s the lovely Teddy Bear birthday cake! At the birthday party, this little birthday girl just can’t wait to open all the presents while we were still singing birthday song for her. So, she were busy opening all the beautiful boxes before she cuts her lovely teddy bear cake. LOL! “Hot! Hot! Very Hot!” That’s what she told me after she touched her forehead this morning. “Then, you got to take medicine. So sorry, baby!” Mommy has no choice but to force the birthday girl swallow 3.5 ml of paracetamol again and again. Mommy really feels so sorry to see her get sick on her birthday. Luckily, the fever seems not as high as what it used to be. At least she sweats after taking the paracetamol. Then, the temperature just went back to normal after taking paracetamol and 30 minutes of continuous swapping. Not this time! Mommy prays hard for her temperature will not go too high tonight. After all, she’s the birthday girl. Mommy really don’t want her to suffer from fever. Not on her birthday. It started yesterday. And, hopefully it ends by tomorrow. Oh…What a birthday! Don’t worry! Daddy will be back soon to play with you. Mommy really got to depend on daddy to cheer you up. He is simply good at it. Just as good as his knowledge of the various life insurance rates. Ha! Now Little Elizabeth is 18 months and 1 day old in exact. Anyway, Elizabeth don’t really enjoy eating that piece of chocolate banana cake. Oh! My dear, I though you like chocolate and banana? 😯 Don’t worry! Only mummy will need acne treatment after eating too much of chocolate. Not you, baby! Actually, Elizabeth loves chocolate and banana. But, mummy forget that she doesn’t like cakes. hahaha…..
At last, baby enjoyed herself so much in the pool with her be loved daddy! At least some fun! Lizzy, please remember that your 1st birthday party is actually a BBQ party. However, mum really got no time to snap a pic on the BBQ stuffs. So sorry ya, my dear! And, we have all sorts of fizzy drinks. Even though 3 of the little ones including Lizzy were drinking Ribena. I guess everyone is waiting for the updates about Lizzy’s birthday party. Even daddy keep asking me why he still can’t see anything about her birthday in the blog. Mummy is so sorry, Lizzy. I am doing it now, ok? Dear Lizzy, mummy got a house for your 1st birthday. Hopefully few years later when you look back into these photos, you will still fall in love with this cake. As mummy make the choice, I think you would prefer something really colorful and triking. So, I pick this “Red Mushroom House”. Now that you got a house, may be I will get you a doll next time. And, I promise I will bake a beautiful birthday cake for you in the future with my own 2 hands. And, mum and dad also think that this 3D cake from Coffee Bean Cafe really worth its price as it did appeared more attractive than the sample photo. Anyway, this 3kg chocolate butter cake definitely looks great from the outside but taste normal for the inside. Most of our family members are not happy with the taste during the party. It’s hard! You know why? That’s your mum’s fault as mummy shouldn’t place it so long in the fridge. The cake is still cold and a bit hardening when we cut and distribute it to everyone. However,when we ate the cake after it had been defrost during the next day, the chocolate taste became so rich and hardness of the cake is just nice. Anyway, the sugar paste used to create the house was meant to throw away. Full of coloring and you will never like it once it melts in your mouth. It’s too sweet, just like you are seating sugar. 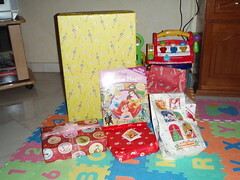 Tomorrow is my little princess official birthday party which we only celebrate among family members. I guess my only concern is her 2 cousins. 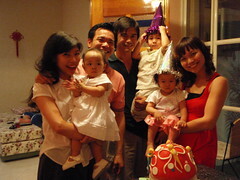 I am so glad that they manage to attend her birthday party as she really loves to have kids playing with her. After all, it’s her birthday party. She is the limelight and the party should be something delighting her. Want to have a look at her birthday decoration? Check it out here. 3 days ago little Lizzy was sick. She got fever. However, I didn’t bring her to the doctor this time because I still have paracetamol with me. For 3 days, I just watch her carefully. And, I did gave her paracetamol during the second day when her fever is about 39 degree. After 3 feeds, she finally recover the next morning. Time flies. Today is already my girl’s 1st Birthday. And, if you asked me how do I feel? I felt like she has grown up a lot. Now that she is stronger. I am glad that finally her body system can quickly recover from her sickness. Also, I am proud that She can calls “Mama” now. And, she practical learn up those have been taught almost immediately. Even if we don’t teach her, she will still catch up all the vocabulary through her own observation. She is still in bubbling stage. But, she already understand that if she wants to walk, she has to wear shoes. She likes to walk in the garden. She can remember where all the things kept. She will open the cupboard on her own and take out the shoes to let us wear for her, every time she wants to walk in the garden. She still wake up every night for her milk. Each time, she only take about 4 Oz pf milk. However, she prefer chocolate flavor now. Thus, instead of only Babynat, now I will add 1 scope of Dumex 1+ chocolate milk for her. If she wants milk and she was given with the wrong thing, says water, she will say “milk milk”. Still no meat for her, but lots of fish and vegetables. She will eat rice with soup sometimes, instead of only porridge. She has about 6 teeth now. She is still taking jar fruits because she likes it so much. She can walk very well. She will say ” mai mai mai” means don’t want in Hokkien, if she rejects something. Still very clingy to mummy. She likes to play Peekaboo. And, she looks really cute when she is trying to bend her body a bit and so that she can look out for us while she is still half hiding behind the door. She like soft toys too including Patrick ( the dog), Teddy bears and Winnie the Pooh is her all time favorite. ( In fact, she will hug her Pooh every now and then). She can point out car, apple, toothbrush, comb, bear, dog, lion, swimming costume, banana, fish, bird, giraffe, elephant, shoe, flower, fan, snail, and so on. She is quite concern with her things now. For example, if I show her something in the supermarket and mention that I’ve bought for her, she will ask me to take it once the cashier has packed it in the plastic bag. Things that scare her and will make her cry: someone with mustache, dogs’ bark, car horn, my dog.